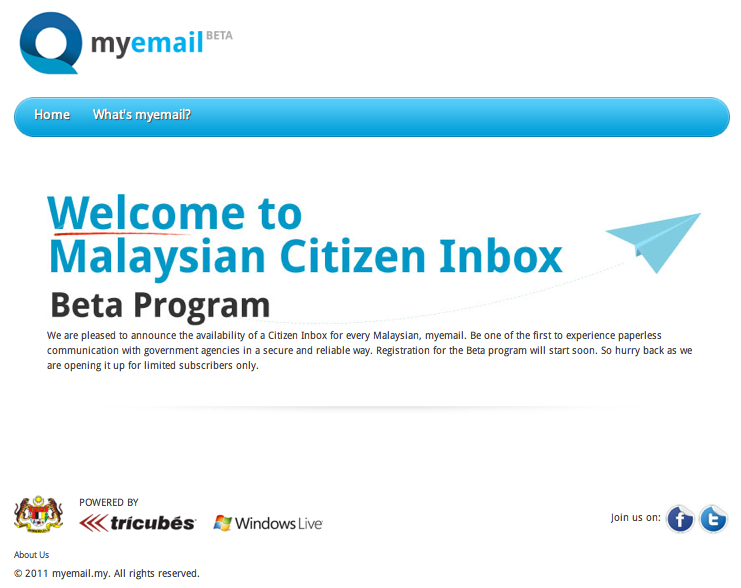 Malaysian government has launched a new initiative in ICT advancement for a citizen email program: MyEmail 1Malaysia. This program lead by the government agencies so called MAMPU, PEMANDU and developed by a collaboration of Tricubes Ltd and Microsoft Inc.
Tricubes Ltd is a local company that capable to roll out this state of the art innovation and committed to deliver the whole infrastructure and integration. I'm more interested to review the concept of having a citizen email. This project actually can be formal medium of communication between the citizen and the government. I'm totally agree with that statement, because, from now on I can't found any free email system out there (i.e: gmail, yahoo mail, facebook) can validate the real user. Technically impossible to validate that. Gmail can terminate your gmail account if we violate their terms and conditions without your consent. Do you really believe that brad.pitt@gmail.com really belongs to the famous actor Brad Pitt. Or michael.jackson@yahoo.com really belongs to the late Michael Jackson, king of pops ? I don't believe that. So many cases happen on identity theft with gmail, yahoo. Anybody can pretending be someone using other people real name. Or the dangerous part is, we can't complaint to gmail or yahoo mail if our email been hacked or been misused by others. The famous case happen is, when your gmail account been hacked, the hacker will send an email to your colleague or relatives.. asking financial help and urgent. Damn ! You are in big trouble then. Google and Yahoo wont help you much to solve this matters. 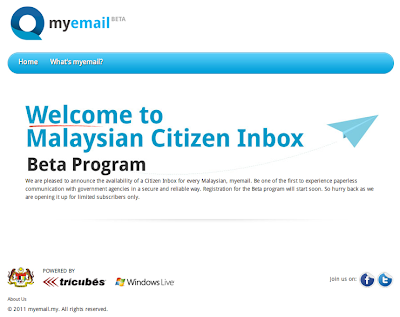 I have been informed that, this citizen email is tagged with Malaysian Social ID number. We can verify and validate that, we are the owner of that email. So now, we can ensure that the owner of that email is really belong to that real person. If one day, you received an email from ben.escurado@myemail.my ... yes ... that is me. You can verify it with related government agencies in Malaysia. How about company email ? can it be validated ? Sometimes yes... jobs@apple.com is belong Steve Jobs. But what happen if you change job ? you might have another new email right ? Couple of months ago, Aruba Networks introducing a technology so called MOVE. Aruba Networks predict, next generation lifestyle will be in a hyper dynamic mode. People are moving around. Today you might be in Boston, tomorrow you might be at Texas or New York or Chicago. Who knows. Aruba got a solution for VBN (Virtual Branch Network) where we can do a remote office any where we go. That is how people move in the future. If the next generation lifestyle change into a hyper dynamic mode, for sure we need something that follow us anywhere we go.. something like document follow us. Now people are talking about cloud computing. We can store all the important document (digital format) into the cloud. How about to receive confidential electronic document from government agencies or other similar parties such as banking and insurance. Look back at the history of email. Email been developed for a military usage (DARPA Project). The military want to sent some confidential message to someone direct to their personal mailbox. The US military can sent message direct to US President personally. Very efficient and confidential. If we want to received an important or confidential document... can we trust gmail, yahoo! mail ? Or do the related agencies believe that, that is your real email ? When the Malaysian government announce about this initiative, I said wow ! I heard, Singapore government also want to follow this concept. I believe, other country also will follow later. Since, Tricubes Ltd is the pioneer for this initiative, they can provide consultation to other countries that interested to have this such programs. With this validated email, and full integration of e-government system, I can see that, in the future, we can simply request what ever confidential and important documents, which traditionally been sent via post (where it takes 1 - 3 days of delivery period) to online systems direct to our citizen inbox. For instance a utility bills, bank statement, tax statement, medical document/prescription, land and property docement and others direct to my validated inbox. I can retrieve it anywhere and I can keep it in a secure cloud. I can use this email for the whole of my life. This is part of Green Technology initiative. 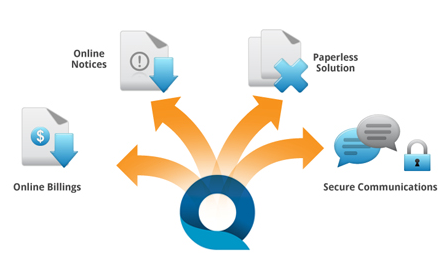 Truly paperless concept. Save the trees and save the earth. Everything will be in electronic document. For sure, the concept offers high efficiencies and security. Mr. Obama, please look at this initiatives and try to create something similar to what the Malaysian did. Talk to Bill Gates on how link our social ID and email. No Scammer No Jammer. The funny things about MyEmail is.... the Government agencies who maneuver this project is really unrealistic in getting the number of subscriber within a short period. The mentioned agency is known as MAMPU. Their target is about to have 9 millions subscriber within a year. Really unrealistic target. Malaysia only got 27 millions population. At most we can assume... active internet user probably 30% = 8 millions. Are they able to meet and convince every 8 millions people just within a year ? Google world wide also start very slow during their initial start. Statistically, the online subscriber grows exponentially for certain period of time. Be realistic when targeting something. Everybody in this world believe that, majority of the government worker only know to talk but not know how to walk.